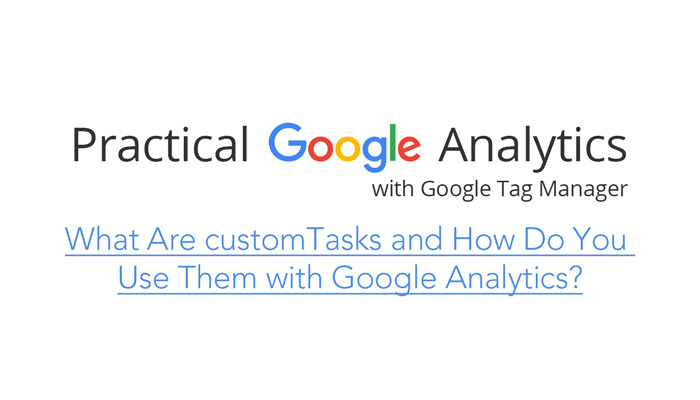 What Are customTasks and How Do You Use Them with Google Analytics? By using standard get and set methods, you can access tasks, replace them with custom functions, or chain custom functions to execute before or after an existing task. Chaining a custom task function to execute before or after an existing task allows you to insert a new functionality. Replace the sendHitTask with a custom task function. ga(‘set’, ‘checkProtocolTask’, null); // Disables file protocol checking. As Google Tag Manager starts executing the tag code, it will find the customTask field and resolve the variable to a closure — this is a function that receives a parameter as a model object automatically. Again, you can manipulate the model object with get and set methods. You’ll need to set the Custom Dimension at index 5 (the value comes from the customDimensionIndex) to the ClientID. The get method of the model object is necessary to retrieve it. This tactic is sufficient to tell the Google Analytics tag to fetch the Client ID from the tracker object. It will then send it in a Custom Dimension — there are no more setups required. Despite the fact that you are overwriting a task method with this tag, it will lead to no problems. This is because a customTask has no other function in Universal Analytics. Try the above for any fields in the model/tracker object to access and manipulate a variety of tasks.